I remember the first time we really, really, really needed Maxtrax. 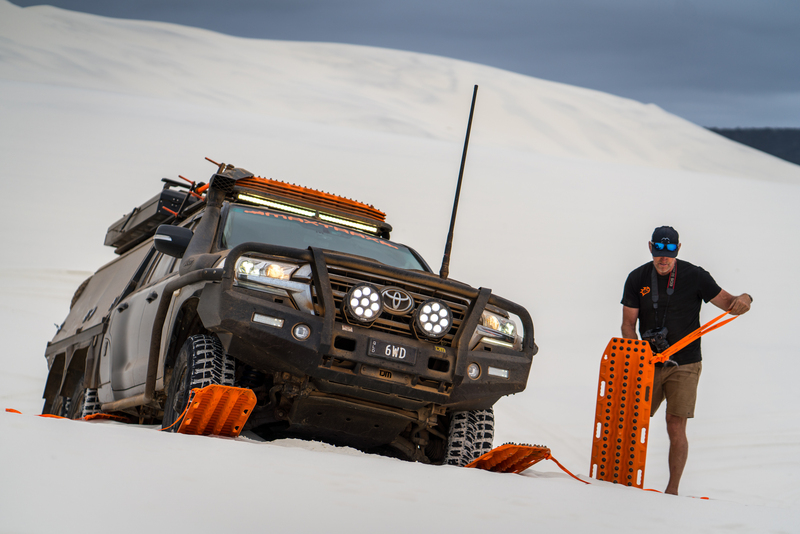 The Expeditions 7 team was deep into the Canning Stock Route in Australia and encountered a half-mile long, water-logged track. We had already been stuck many times that day, but this would prove to be the greatest challenge. Fourteen hours later and with the help of 12 Maxtrax MKIIs, we were finally free. We broke a winch, a winch line, and a fairlead in the process. With the winches disabled, we built a road of Maxtraxs to achieve freedom from the bog. 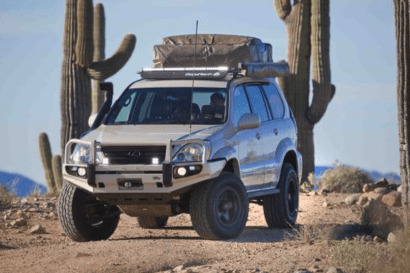 In the years that Maxtrax have been available, they have gone through several iterations. 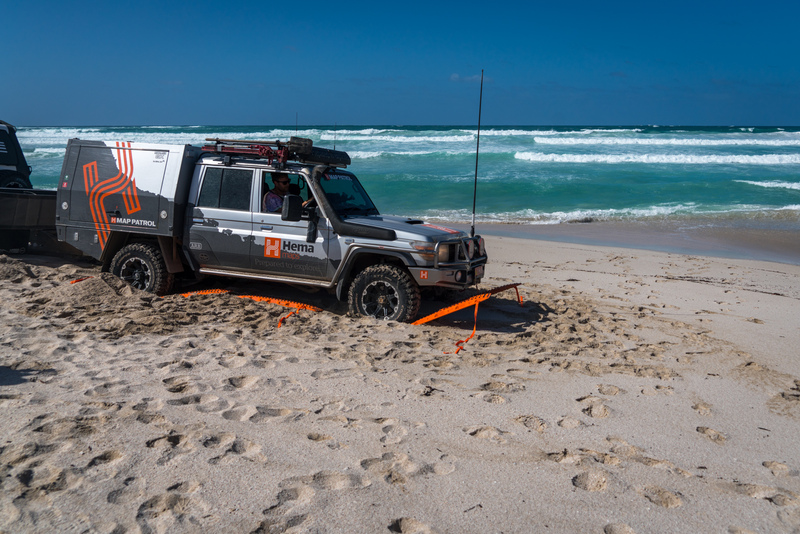 Their founder, Brad McCarthy created the first prototypes out of pure necessity, nearly losing one of his Land Cruisers to the rising Australian tides. 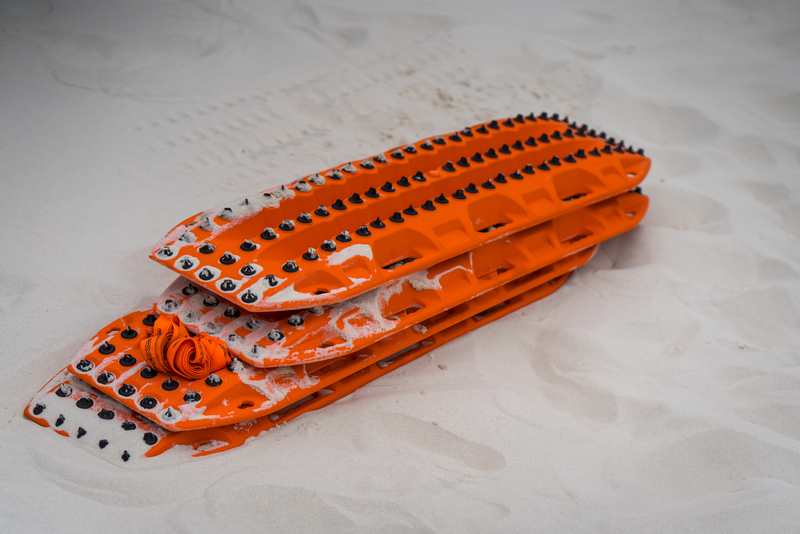 The MKI was good, and now the MKII is even better, but their newest version, the Extreme is the most durable and effective Maxtrax yet. In late October, I got access to a set for evaluation in North America and then I had access to 16 units total in Australia for comprehensive and repeated field tests along the Great Australian Bight. 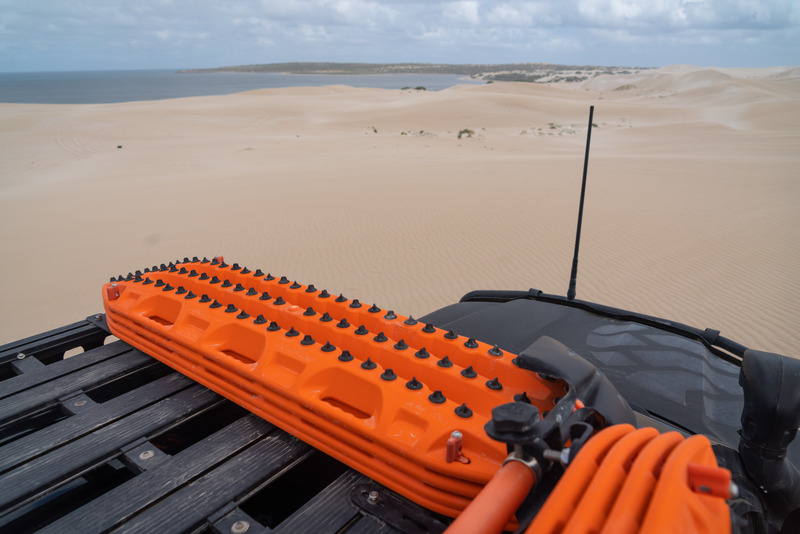 The conditions of the track were difficult, criss-crossing large dunes and long stretches of beach. 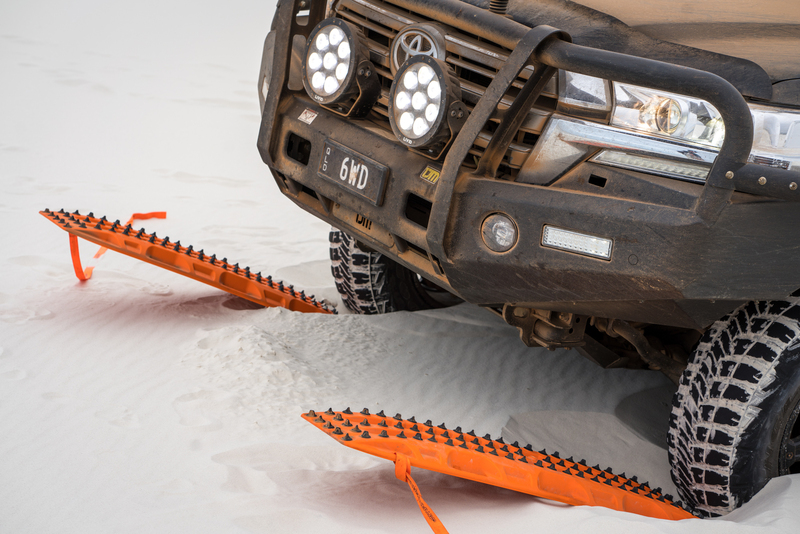 Some days, the Land Cruisers were stuck a half-dozen times, and each time we employed the new Maxtrax Extreme. And it was not just because we wanted to test the new product, but because it was simply the best tool for the job. Properly stuck on the beach with a rising tide. 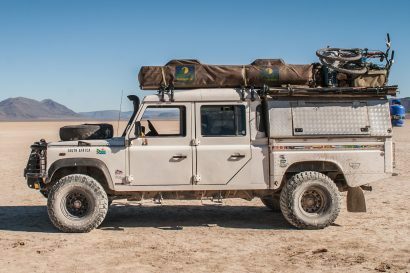 This is what adventure is all about! 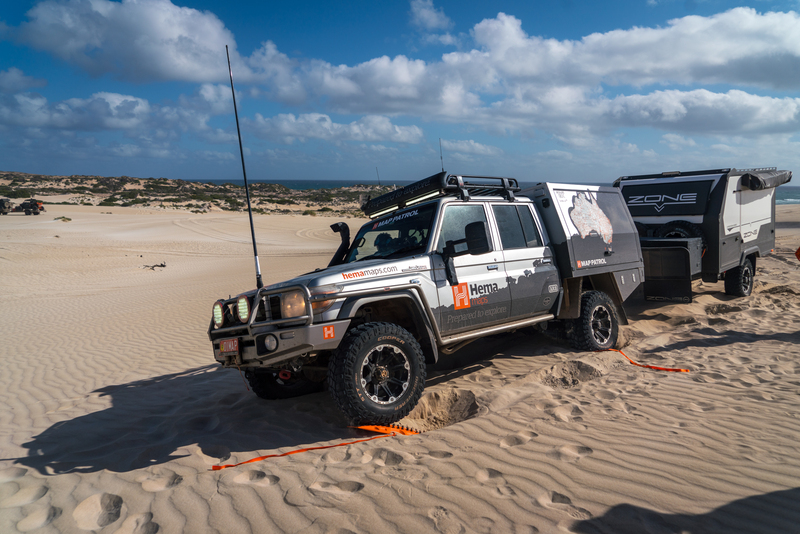 The features of the new Extreme are notable, but nearly all have an emphasis on increased durability, which was as a result of Brad’s military client needs. The MKII is a good tool for occasional use, but it does require a driver with enough experience to manage wheelspin. Excessive wheelspin creates heat and can damage the MKII teeth. To address this, Brad worked with his engineers to incorporate 88 user-replaceable teeth into the high-strength nylon. The teeth are coated black and can be field-serviceable with a TORX bit. The profile of the metal teeth on the Extreme is nearly identical to the nylon ones on the MKII, but they will survive excessive wheelspin and repeated abuse. 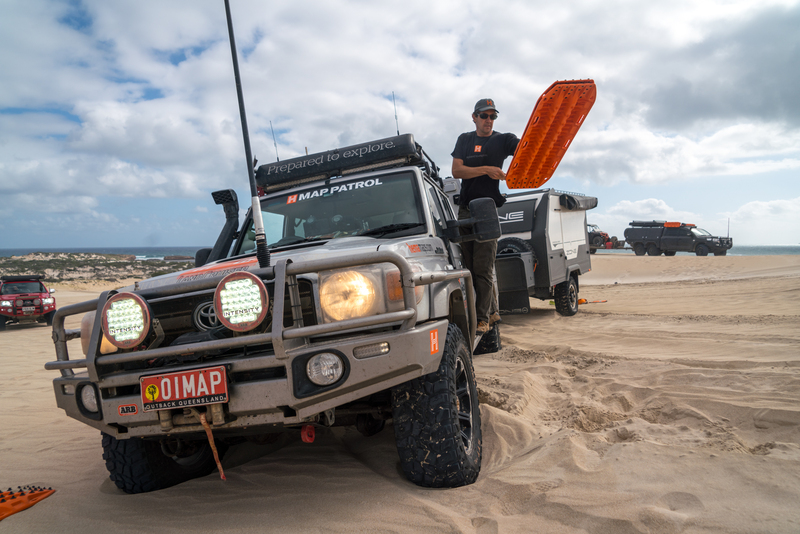 During the entire trip across the Bight we experienced only a few damaged teeth, which was a result of hard impacts to the metal edges of the chassis. This would have broken the nylon teeth too, but in the case of the Extreme, we just replaced them. 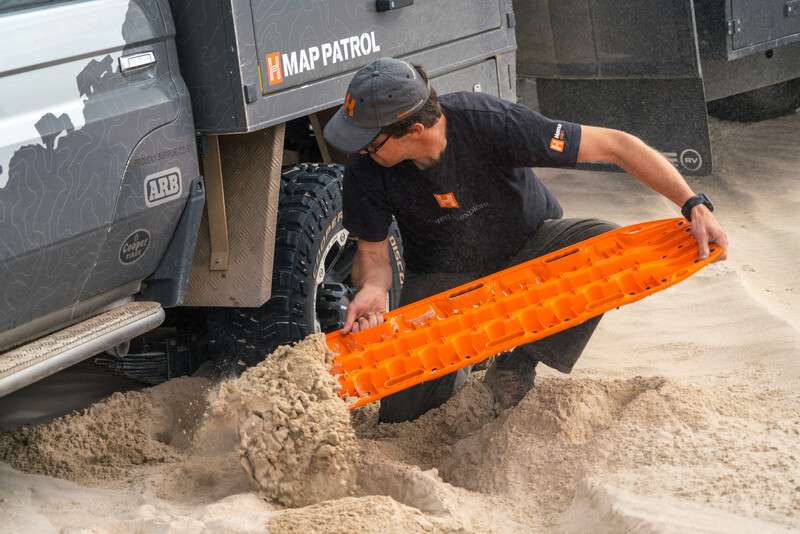 One of the key features of the Maxtrax is that every board also works as a high-volume shovel, helping to clear material from in front of the tire and allow for proper placement of the track for recovery. Also shown is the backside of the board, where the metal teeth are molded into the board, but are still field serviceable with a Torx bit. 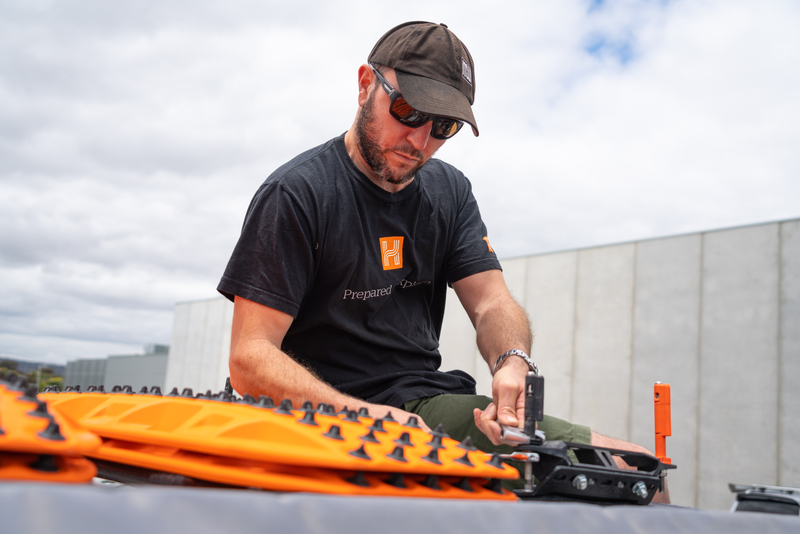 There are a few other key updates too, with additional reinforcement of the back of the board for higher weight-carrying and spanning capabilities and increased durability. The added thickness at the leading edges of the boards helps with bridging and ramping, and also provides increased material for supporting the threaded studs. In practice, it all works as hoped. Surprisingly, the metal teeth and added material did not significantly increase the weight (about a pound per board), but it did increase the total nested height of a set of tracks. Four tracks sits about an inch taller. 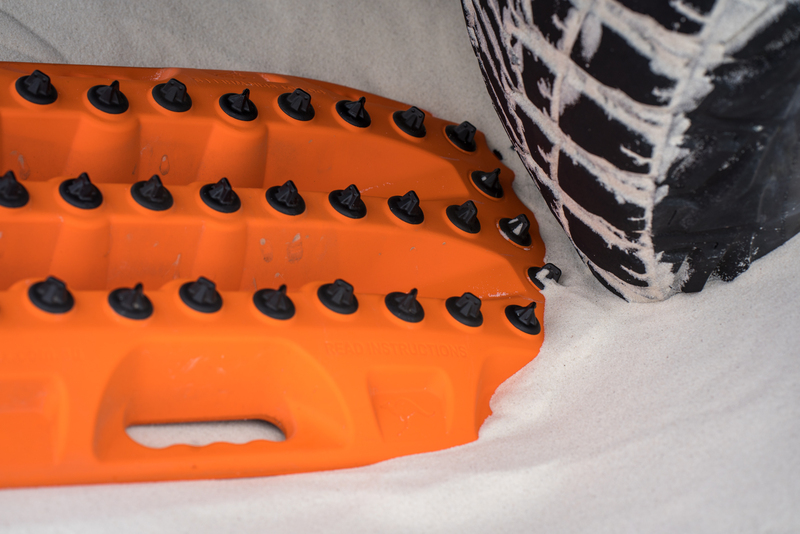 As shown in this image, the Extreme mounting pegs (orange) are taller than the standard MKII mounting studs (black). 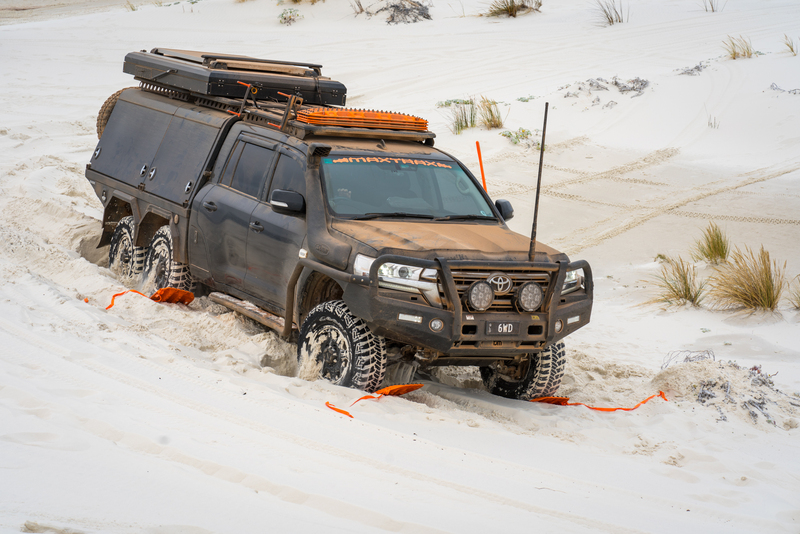 Editor’s Note: To preempt some of the potential comments, we would like to note that with the images of the stuck Land Cruisers, they were all aired down, some to low teens or even single digit PSI. What may look like an over-inflated tire is actually the slope influencing ground pressures. The second note is regarding the images that show participants on the trip working with recovery gear without gloves. At Expedition Portal, we recommend gloves, sturdy shoes, proper attire, and eye protection during any recovery operation. I say recommend, because people get to be adults and make their own choices, and each scenario can be different. Best practice is still best practice though—wear PPE. The heavy VDJ79 (also pulling a heavy trailer) exits from the mire, thanks to the boards. 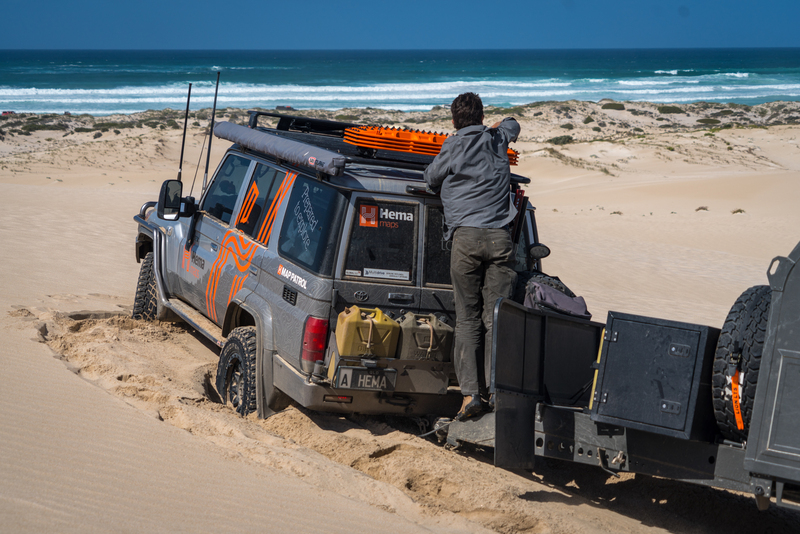 Big sand dunes and big Land Cruisers require extreme tools for recovery. 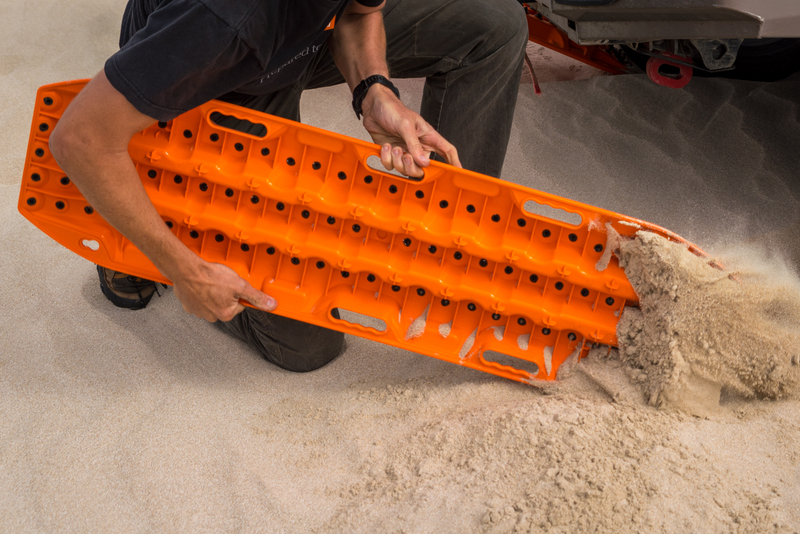 Time spent preparing for the recovery is always worthwhile, including clearing the chassis of ground material and digging an exit ramp for the tires. Nice site! 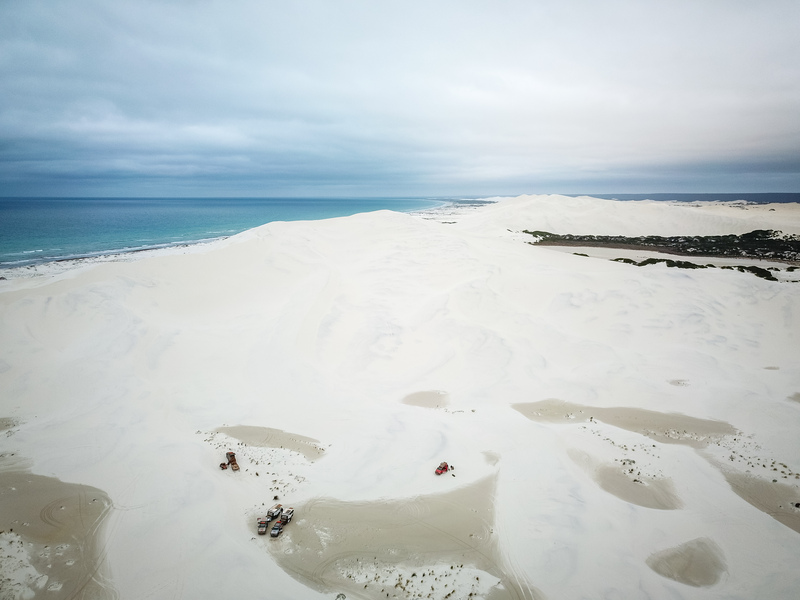 I found it via the Airstream, Inc. newsletter. Nice review Scott! 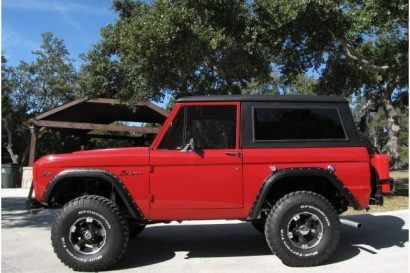 I’ll be upgrading from my original MkI MaxTrax to the Extremes. Have been waiting for them to fail, but they’re still going strong (minus a few teeth) after almost 10 years regular use. I remember one idea behind the nylon teeth was to limit tire damage; did you notice any significant tire damage caused by the new metal teeth? Great comment. The profile of the teeth has an appropriate radius at the end and they avoided sharp edges. It looks like it will be ok on tires.